Automated test equipment (ATE) market size is anticipated to reach USD 4.46 billion by 2022, growing at 2.6% over the forecast period. Increasing design complexity along with need for effective testing are expected to fuel the demand over the forecast period. In addition, increasing range of consumer devices is also likely to positively contribute towards industry growth. Defense automated test equipment market size anticipated to be the fastest growing application segment, valued at over USD 130 million in 2014 and is expected to grow at CAGR of 3.5% from 2015 to 2022. Cyclical variations in the industry are expected to restrain the semiconductor automated test equipment market size over the forecast period. The semiconductor demand fluctuations have resulted in a supply demand gap, as a result, revenue generation is unpredictable, which results in impacted profitability. High smartphone demand has led to growing network capacity. Modern devices offer numerous features including superior quality cameras, touch screen display, high-resolution, etc. With a number of features bundled into a single device and the constant drive for miniaturization, battery life has taken a hit. As a result, the battery life test phase during the design process has taken centerstage. Rise in consumer demand for more features and increased device integration has led to an increase in the number of RF ports. Efficient ATE service design is of utmost importance to circumvent any complecities. IC designs have become more sophisticated with a large number of capabilities in line with changing consumer preferences. IT & telecom ATE market size was valued at over USD 1.8 billion in 2014, and is likely to reach USD 2.20 billion by 2022. It enables communication service providers to enhance the network in order to support new technologies and telecom equipment manufacturers in ensuring consistent quality for the products. Consumer electronics is expected to grow substantially over the next seven years and to be valued at over USD 1.30 billion by 2022. This can be primarily attributed to rising popularity of consumer devices such as tablets, smartphones, and computers. Growth across the automotive segment can be attributed to the extensive use of semiconductor devices across automotive electronics such as Advanced Driving Assistance System (ADAS) market, vehicle-infotaintment systems, etc. 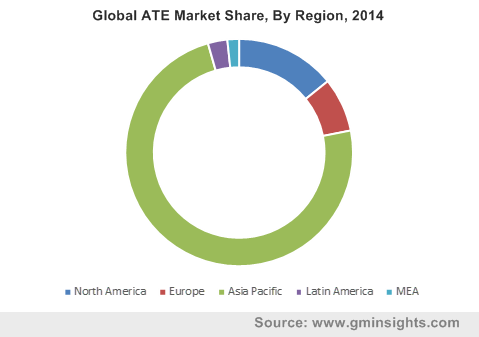 Non-memory ATE market size was valued at over USD 2.5 billion in 2014. The expansion of LTE coupled with growth of the smartphone sector is likely to positively impact revenue. Furthermore, increasing automotive demand and growing number of microcontroller-based applications is expected to drive this segment over the forecast period. Discrete automated test equipment market is expected to grow faster than the global average at a CAGR of 3.0% from 2015 to 2022. Asia Pacific ATE market size is likely to exceed USD 3.30 billion up to 2022 owing to presence of large number of semiconductor industries. Global semiconductor manufacturing equipment market exceeded USD 35 billion in 2014. Moreover, changing customer needs as well as rapid technological advancements and have also contributed positively towards regional growth. North America automated test equipment market share was over 14% of the overall revenue in 2014. Development in telecommunication sector coupled with huge investment in innovation for defense sector is anticipated to boost regional demand over the forecast period. Teradyne, LTX-Credence and Advantest are the major industry players. Teradyne was the leader, and accounted for over 40% of the global automated test equipment market share in 2015. Development of new instrumentation, maintaining close relationship with the customers and enhancing test platforms are likely to be the key growth strategies.